Break out the dirndls and lederhosen and put away your passport (if you’re from the U.S., that is)… there’s a little slice of Bavaria right here in the U.S. of A! 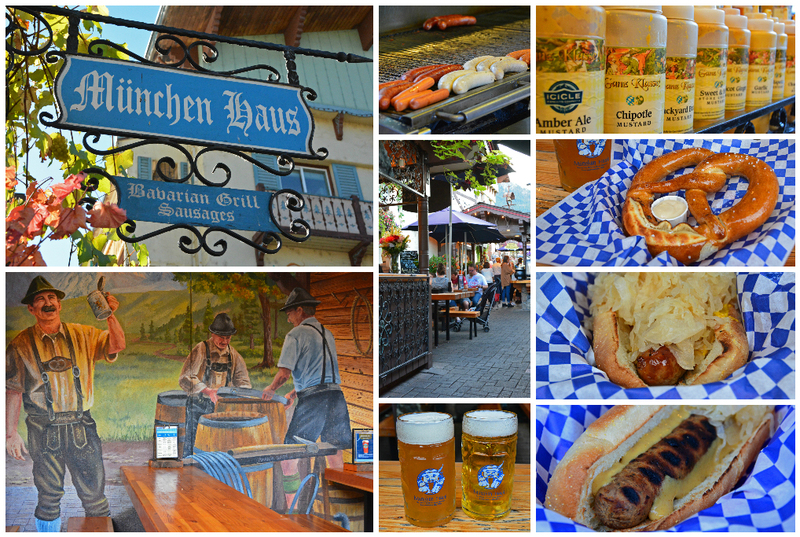 We absolutely love the region of Bavaria in Germany, so when we heard there’s a Bavarian-themed village in Washington State, we simply had to check it out for ourselves! Many Leavenworth events that take place throughout the year are reminiscent of German celebrations and there’s always something going on around town. 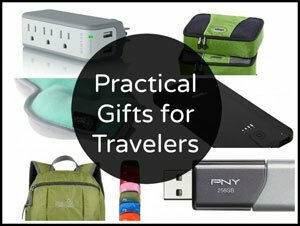 So, before we discuss what to do in Leavenworth, let’s start with the basics! Leavenworth Washington is located along the Cascade Loop, a scenic 400-mile road-trip navigating some of Washington State’s most glorious seaside and mountain landscapes. 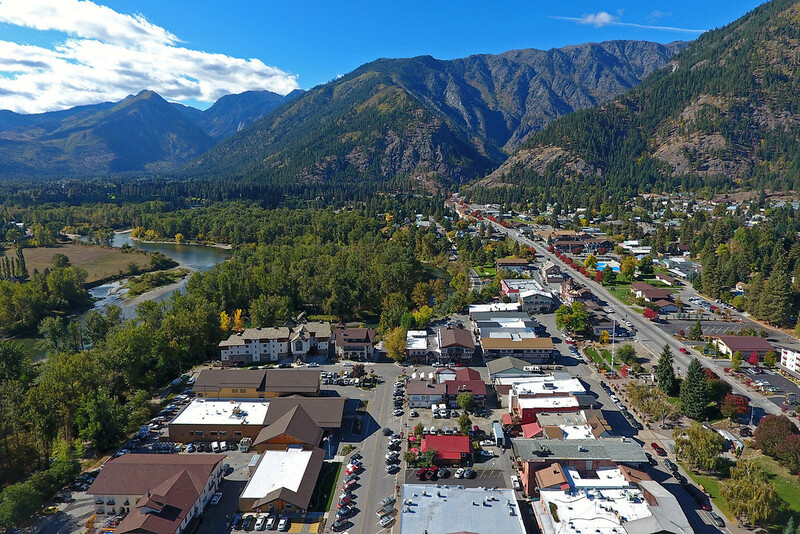 Passing through Leavenworth simply isn’t enough, so we strongly encourage you to visit for a few days and experience all that this wonderfully charming town has to offer. Due to its magnificent surroundings, getting to Leavenworth is an incredible journey in and of itself, regardless of how you choose to arrive. The drive from Seattle is approximately 2.5 hours, and if you’re coming from Spokane, it’ll take closer to 3.5 hours. Since we were driving the Cascade Loop in its entirety, we came via US Highway 2 from Whidbey Island, passing through the breathtaking Tumwater Canyon. If you want someone else to do the driving, Amtrak offers a direct train from Seattle to Leavenworth that takes close to 3.5 hours, or you can also travel to Leavenworth via bus. For more information about transportation to Leavenworth, visit the Leavenworth Chamber of Commerce. 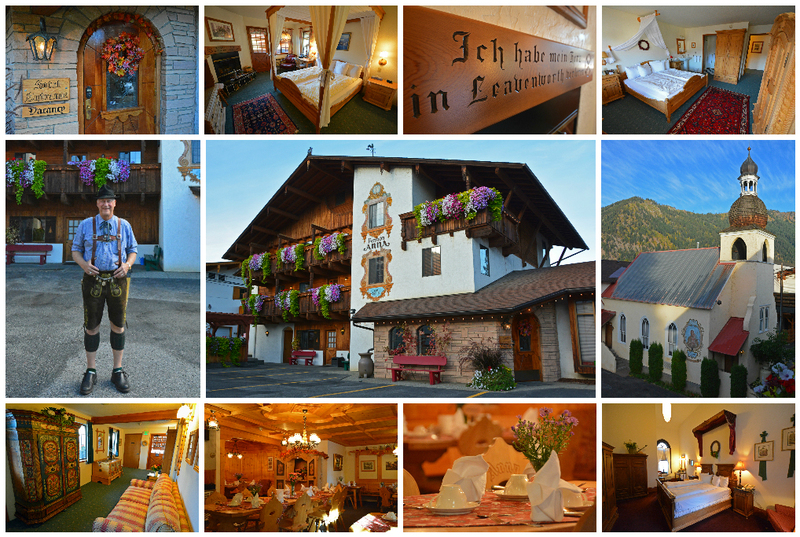 The accommodations in Leavenworth are spot-on when compared to places we’ve stayed during our many visits to Bavaria. 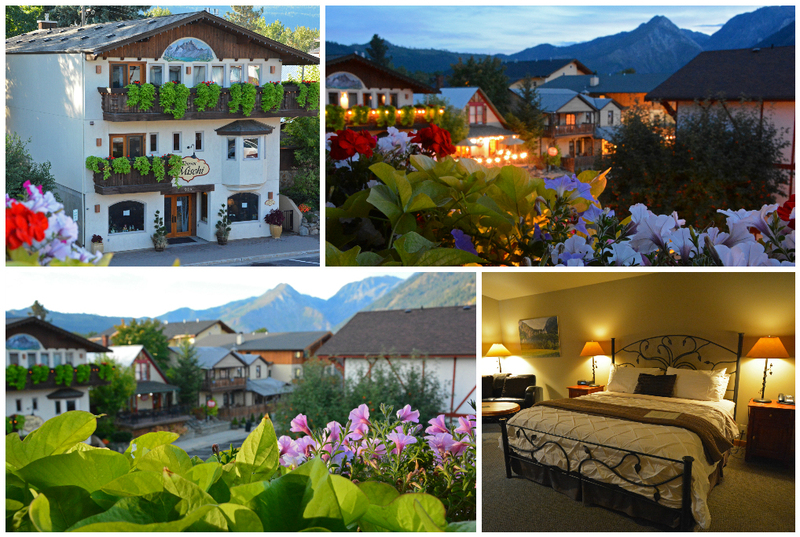 Strolling along downtown Leavenworth, you’ll notice many traditionally-styled hotels, bed and breakfasts, and guesthouses complete with timber frames and colorful flowers. We had the wonderful privilege of spending two nights at Hotel Pension Anna, perfectly located one block from Front Street, the town’s main thoroughfare. 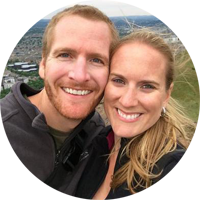 Owners Michele and Gary import traditional furnishings and décor from both Germany and Austria and offer a Bavarian-style breakfast in order for guests to experience authentic Bavarian lodging in Leavenworth. EVENT ALERT: For an extra special Valentine’s Day, book a stay in Leavenworth during Valentine’s Weekend and enjoy wine and chocolate throughout the village. Hotel Pension Anna offers 16 unique rooms, including rooms in an old chapel on-site. We stayed in the Herzog suite, complete with fireplace and two private balconies. It was a real treat to come back to the hotel after a long day of exploring and enjoy a delicious bottle of local wine on the balcony as the sun dipped behind the mountains. 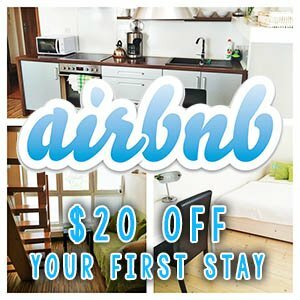 If you’re interested in a more modern European feel, they also offer four luxury suites in Pension Mischi, located just across the street. And for a truly lavish experience, consider a stay in their all-new Bodensee spa/suite condo, complete with full kitchen, living room, dining room, king-sized bed, 1.5 baths, washer/dryer, private steam room, and hydro-therapy tub. It’s a luxurious hotel stay and a trip to the spa all rolled into one! EVENT ALERT: Tantalize your taste buds at the Taste of Leavenworth (first weekend in April) and enjoy locally-made culinary specialties. 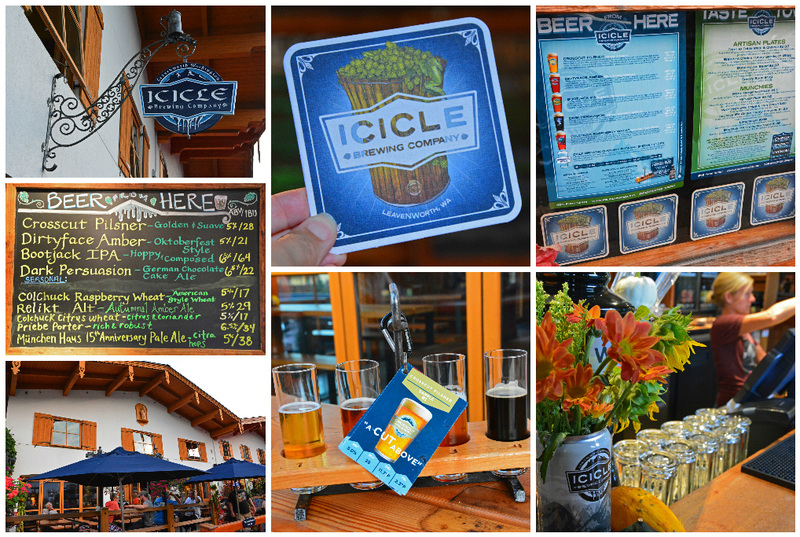 The beer at München Haus is provided by none other than Icicle Brewing Company, which just might have something to do with the fact that both places are operated by the same owners! They sure do know how to make a good pairing! To visit the tasting room at Icicle Brewing Company, simply walk to the other end of Front Street. Here you’ll find an even wider selection of delicious brews, in addition to a selection of light plates and munchies. EVENT ALERT: Like beer? Check out Oktoberfest in Leavenworth during the first 3 weekends (Friday & Saturday) of October. Enjoy authentic German food, beer, music, and dancing. There’s also AleFest (third weekend in April). Ok, so maybe beer isn’t your thing. It could be that you’re more of a wine girl (or guy), and if that’s the case, look no further than Wine Girl Wines. Offering a variety of bright, fruity, refreshing white wines, along with bold red wines with serious style, there is quite an array to choose from. 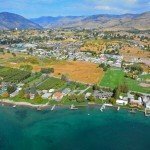 Though the winery itself is located about 70 miles away near Lake Chelan, the Leavenworth tasting room provides the perfect opportunity for sampling these award-winning wines. EVENT ALERT: Like wine? 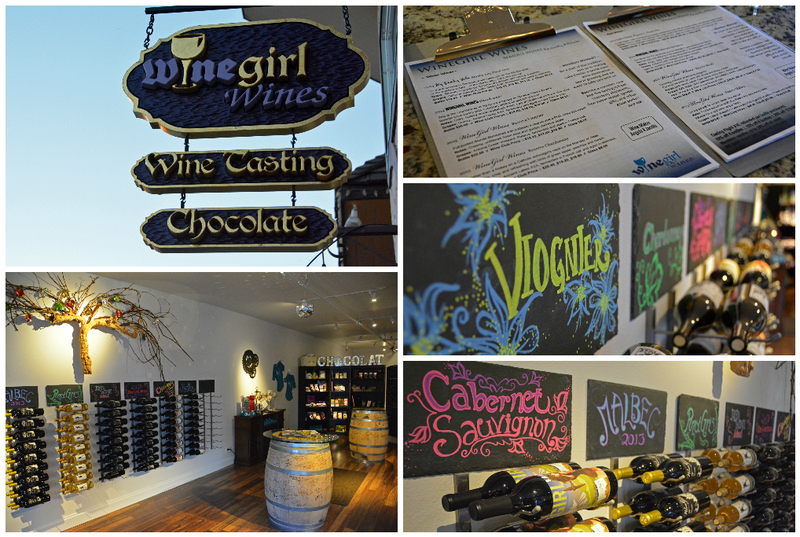 Check out Leavenworth’s Wine Walk (first weekend in June) and sample regional wines throughout downtown. There is no shortage of unique shops in Leavenworth. We came across everything from a cheese shop to an outfitters store and from a year-round Christmas shop to a comic book store. Leavenworth is also home to one of the world’s largest nutcracker collections at the Nutcracker Museum. So, after you’ve stuffed yourself with brats and brews, stroll along Front Street, peruse the shops, and pick up a little keepsake from your visit to Leavenworth. EVENT ALERT: To get in the holiday spirit, check out the Christkindlmarkt (Thanksgiving weekend) and Christmas Lighting Festival (first 3 full weekends in December) for a Leavenworth Christmas! Though not much beyond the shops, restaurants, and accommodations near Front Street get much of a mention, just outside the hustle and bustle of the brimming downtown area is some seriously gorgeous nature! 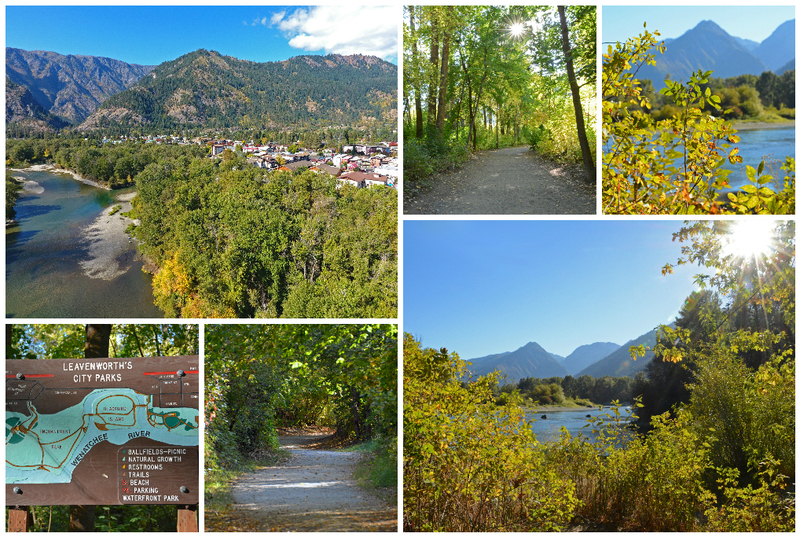 Only 2 blocks from the town center is the entrance to Waterfront Park where you can wander along 2 miles of trails running alongside the Wenatchee River. Beyond that is over 700 miles of forest service hiking trails for you to explore. So, while Leavenworth’s gorgeous scenery may not be as well advertised as its annual Oktoberfest celebration or Christkindlmarkt festivities, its beautiful nature definitely warrants some further exploration. EVENT ALERT: Do you enjoy nature? Check out the Spring Bird Fest (third weekend in May), a celebration of birdsong and the natural world. 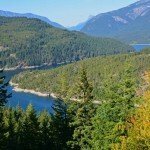 Speaking of gorgeous scenery, Lake Wenatchee State Park, located in the outskirts of Leavenworth, contains 8 miles of hiking trails and 7 miles of biking trails. In the winter months, the area is well-accessed by adventurers for cross-country skiing, snow-shoeing, and sledding. 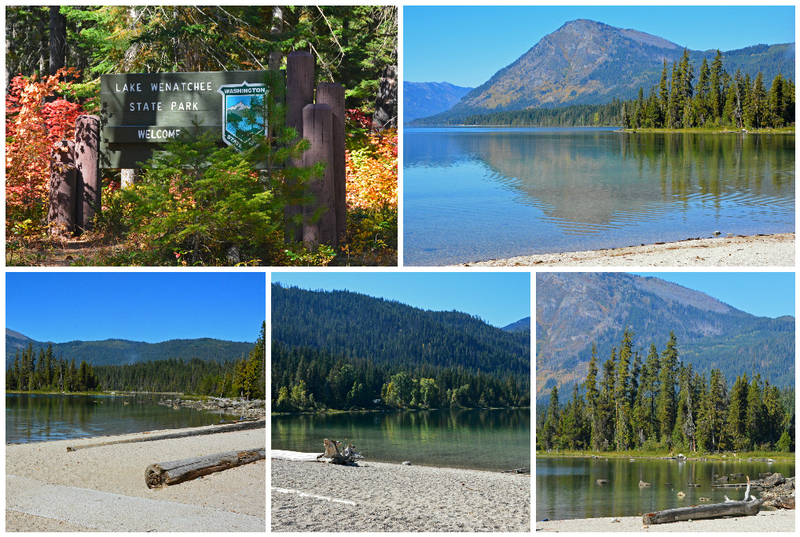 Lake Wenatchee is the most notable feature of this state park, and is popular among aquaphiles (people who love the water/swimming) during the warmer summer months. EVENT ALERT: If you prefer the winter months and enjoy playing in the snow, check out the Bavarian Icefest (January-MLK Weekend), it’s a day full of games for kids of all ages! Finally, if you’re looking for a bit more of an adrenaline rush… why not give ziplining a try?! 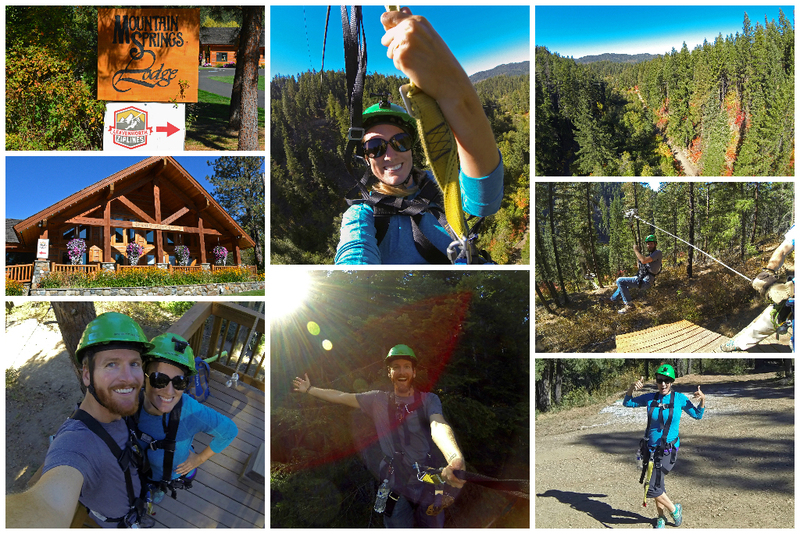 Located 14 miles from downtown at Mountain Spring Lodge is Leavenworth Ziplines. Soar above the treetops as you tackle 9 ziplines, 2 suspension bridges, and 1 double-decker platform. Let the wind blow through your hair as you zip 190 feet above the valley floor. 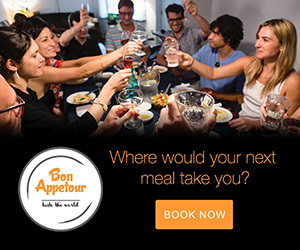 It’s a thrilling experience you won’t soon forget! Check out our ziplining video below! EVENT ALERT: Looking for a different kind of adrenaline rush? Check out the Bavarian Bike & Brew (first weekend in June) and participate in a sanctioned IMBA (International Mountain Bicycle Association) race. So as you can see, this charming mountain town sure has a lot to offer, and fortunately for Americans, you can get a taste for Bavaria without having to leave the country. With Leavenworth events and festivities taking place throughout the year, there’s definitely no wrong time to visit, so… what are you waiting for?! Start planning your visit to Leavenworth today! To hold you over until your visit, you can keep an eye on all of the happenings via the Leavenworth web cameras. 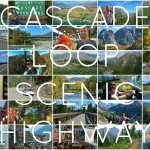 In addition, consider taking a road-trip along the scenic Cascade Loop in Washington. 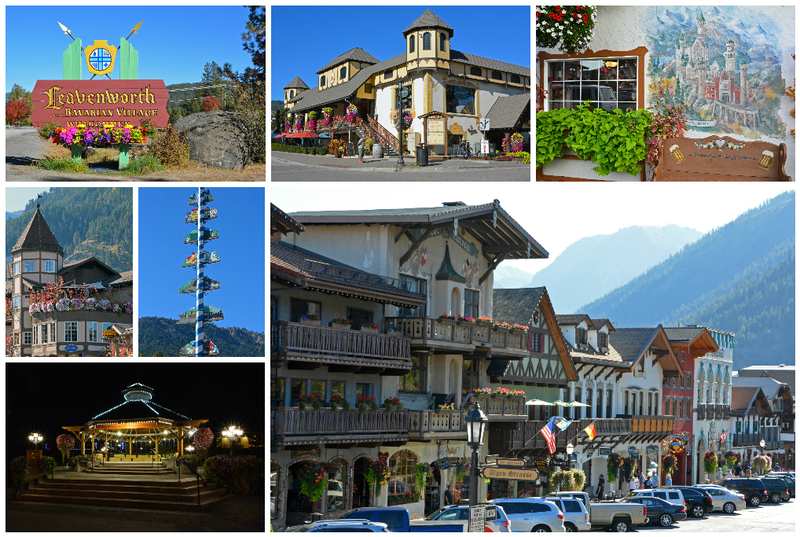 The town of Leavenworth is just one of many amazing stops along this memorable and stunning journey. For a quick look at our entire drive along the loop, including our time in Leavenworth, check out our video below. We’d like to thank the Leavenworth Chamber of Commerce for sponsoring our visit to Leavenworth and to Hotel Pension Anna for providing accommodation during our stay. As always, our write-ups are an accurate reflection of the experiences we had. I’ve never even heard of Leavenworth and it is insane! I had no idea there was so much going on in such a small (and apparently VERY enthusiastic) place. I’m all about a holiday celebration, and would probably love the Christmasmarkt! 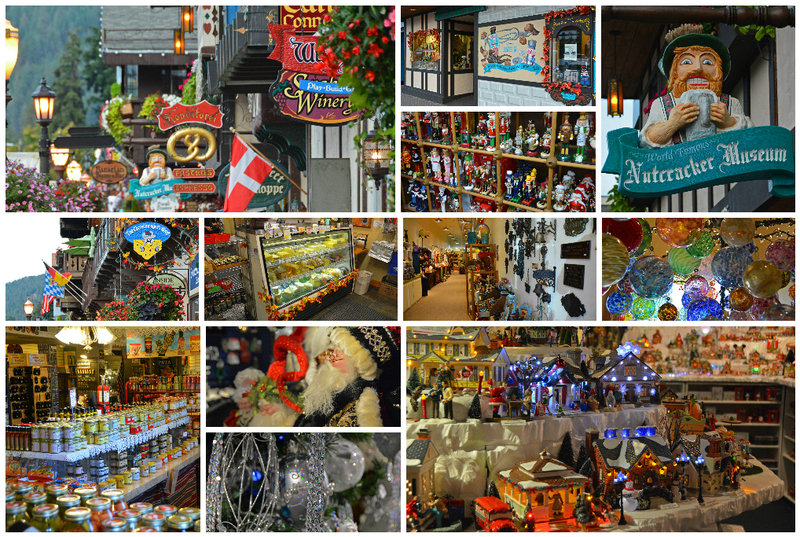 Leavenworth is very enthusiastic about their town and traditions… a wonderful place to visit for sure! We hear winter there is absolutely gorgeous! Ah, I love Leavenworth! I grew up in WA, so have visited many times, but never as an adult – which means I’ve missed out on all the beer goodness! A fall trip would be beautiful and perfect combination of Oktoberfest, autumn hiking, and the changing colors of the leaves. Seriously, fall was the perfect time to go! Though again, with everything going on throughout the year, really any time is a great time to visit. I was pretty bummed that we missed Oktoberfest by just a few days, but it just couldn’t work with our schedule. Maybe another year! We did Oktoberfest in Munich last year, so we’ll definitely need to visit the Leavenworth festival to see how it compares! That’s so neat! Looks like not only would it be novel to see the Bavarian theme, but also incredible scenery all around. Hello road trip! 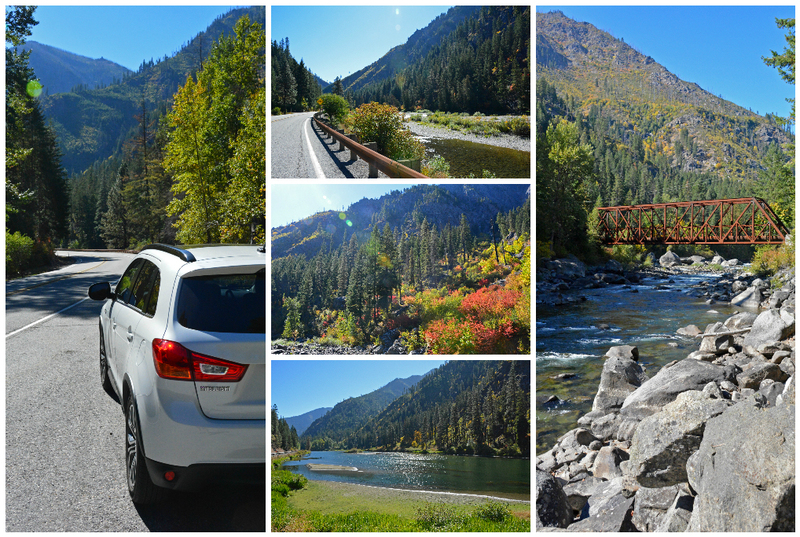 The Cascade Loop is the PERFECT road trip and Leavenworth was one of our favorite stops! Like you said, perfect scenery all around! I live in Leavenworth, and I love it! I agree that most people come for the shops, beer and brat, but they really should check out all the amazing hiking and outdoor activities we have in the area! The road trip as a whole was AWESOME, and the town of Leavenworth was a definite highlight! Leavenworth should definitely be on everyone’s US Bucket List! We’re obsessed with small towns in Europe, so this was a great find for us right in our home country! Very informative post on Leavenworth. I wasn’t aware of this place. The hiking activities there is surely an attraction and I am also adding wines to my list. I am amazed there is a museum for nut crackers there. I have to see that. Ohh! This looks like a great place to explore and it’s not too far from me. I really need to head up and explore more of Washington. Leavenworth looks too cute to miss. Especially that beer garden. Lucky you that you live so close to this stunning region!